In all my efforts to make cakes and muffins and cupcakes without grains and sugar this has to be the simplest and most satisfying cake I’ve made. I made it today – very spontaneously to celebrate Fete des Rois, or Festival of the Kings, because today is Epiphany. Epiphany is the end of the Advent story when the three wise men arrive to pay their respects to the Holy Baby. They treated Jesus as they would an earthly king by falling to the floor and presenting him with expensive gifts. Had I given myself more time to organise it I would have had a crown ready and perhaps some games but that was not to be today. You can read about our past Fete des Rois celebrations. Today, however, I had forgotten all about it. January 6th, already? How did that happen? I didn’t realise until the afternoon so I quickly made up this cake for afternoon tea. I couldn’t find the right recipe I wanted in all my books and scribblings because they were either too complicated or I didn’t have the ingredients – so I cobbled one together with the ingredients I had and it worked. The traditional French galette des Rois is an almond-cream filled puff pastry type thing with the feve baked inside. The feve is traditionally a hard bean and whoever finds it in their slice becomes King or Queen for the day. My friend has been making a few delicious gluten-free versions of French regional cakes for our past fete des Rois celebrations. Today I thought an almond cake would do the job, and for the feve I used a date because I didn’t want my two-year old to end up accidentally choking on something small. The cake was pretty colourful! I had intended to make the polka-dots with blueberries dropped in to the batter just before cooking, like a clafouti, but in a real Mother-Hubbard moment I discovered we had no blueberries or cherries or any other suitable fruit, not even any dried fruit except for the dates. All we had was Dad’s stash of Christmas candies and so I decorated the cake with candy covered chocolate polka-dots …. I know!! Not exactly sugar-free, paleo or GAPS but very pretty and very tasty. 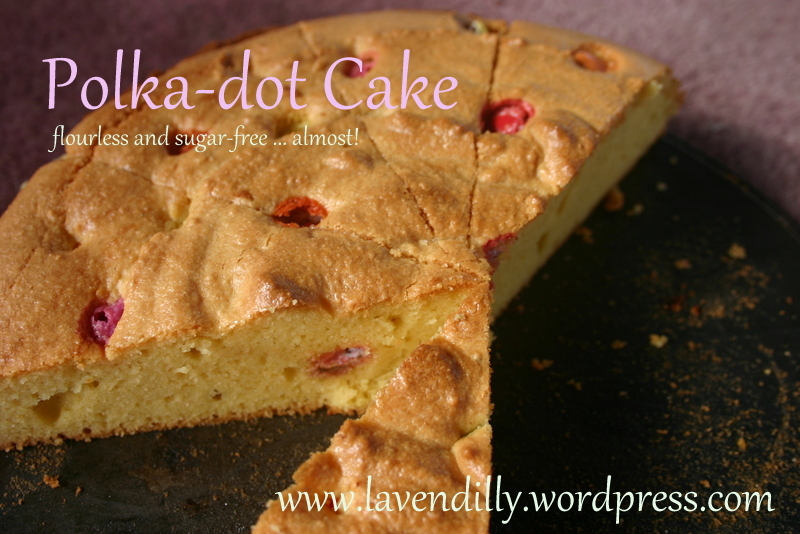 WITH the blueberry polka-dots this cake makes a very delicious breakfast served with yogurt and fresh fruit. Incidentally it can be made without the baking powder so it can be suitable for GAPS and paleo too. It might not rise but it will be more flat like a clafouti, which is how I make it for breakfast. In any case the cake rose and cooked beautifully and we had a delicious afternoon tea with a bit of fun to go with it. 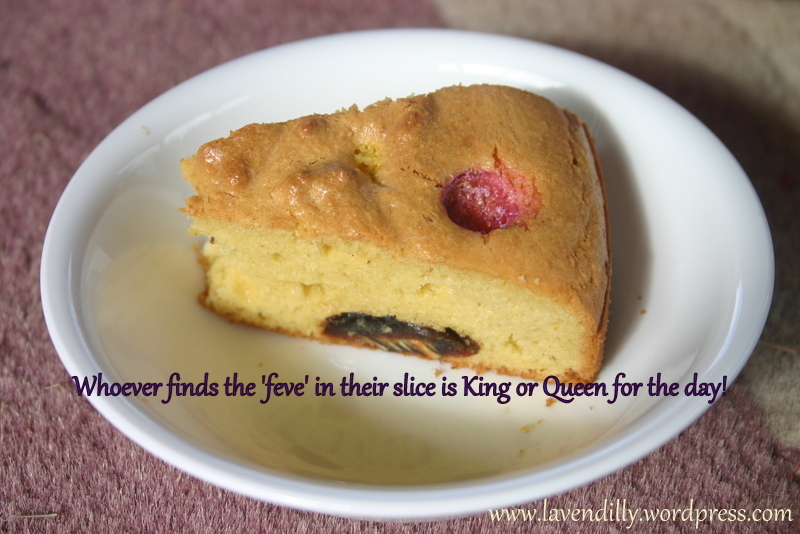 As it happens I don’t think I will use a date again because when I cut the cake, I cut the date in half and then two people ended up with the feve in their slice – so we had two Kings this year!! Mix all but the last ingredient together and blend well. Add the feve to the mix and pour it all into an oiled spring-form cake tin, making sure that the feve is well hidden and then drop in the berries/cherries/things you are using for polka-dots in a pleasing pattern. Cook at 170C for about 25 – 30 minutes … sorry I didn’t pay attention to how long it was in there for. I took it out when the top was a light brown colour and the knife came out clean. Mine was in about half an hour I think. OH! Perhaps mine is the dodgy oven!! I will get a thermometer and check. Glad you enjoyed it. I find it even tastier when I pour it into a shallow container, like a quiche dish, so that the blueberries don’t just float to the top.